SEVIERVILLE, Tenn. — The final day of the Bass Pro Shops Bassmaster Northern Open No. 1 presented by Allstate is one for the history books as Elite Pro Ott DeFoe of Knoxville, Tennessee dominated the waters of his home lake to finish in first place, securing his spot in the 2015 Bassmaster Classic that will be held on South Carolina’s Lake Hartwell February 20-22 of next year. On the final day, DeFoe brought the largest limit of the event to the scales weighing 24 pounds 1 ounce to make his 3 day event total of 62 pounds and 5 ounces. The final day total included a 6 pound and 13 ounce “big bass” of the day which was sponsored by Carhartt. Ott DeFoe's winnings included a Triton 19XS equipped with a Mercury 200 Pro XS (estimated value of $40,000) and $8,021 in cash. This was DeFoe’s fifth major tournament he's won on his home lake, including four Bassmaster events and one PAA tournament. DeFoe also thanked the General Manager of the local Bass Pro Shops, Chris Vaden, saying that he would not be where he was today without the support of Vaden and Bass Pro Shops of Sevierville, which was the host store for the event. Winning on his home lake gave DeFoe the opportunity to raise the trophy in front of his home town crowd, family and friends. Day one on Douglas Lake brought local angler Dewayne Wilson of La Follette, TN into the spotlight with a first place finish thanks to a five-bass limit weighing in at 21-pounds and 12 ounces. Dewayne, the owner of Dixie Custom Rods is established as a top competitor in the area and set the bar early for the other pros fishing the open. Wilson's day one lead was toppled at the end of the second day by DeFoe who consistently brought fish from the depths of the beautiful Smokey Mountain Reservoir. Another Tennessee angler, David Mullins, Bassmaster Elite Pro was right at home on Douglas Lake finishing the event in second place with a three day total of 52 pounds 11 ounces. Mullins, of Mt. Carmel Tennessee, is a “hot stick” that is working hard to carve his name in B.A.S.S. history. This tournament was one of nine events in nine states covering three regions with three tournaments in each region that will send the champions to the 2015 Bassmaster Classic. The events will also help to establish the top anglers in the points race to become Elite Series Anglers as the top five competitors in each region join the ranks of the best in bass fishing. 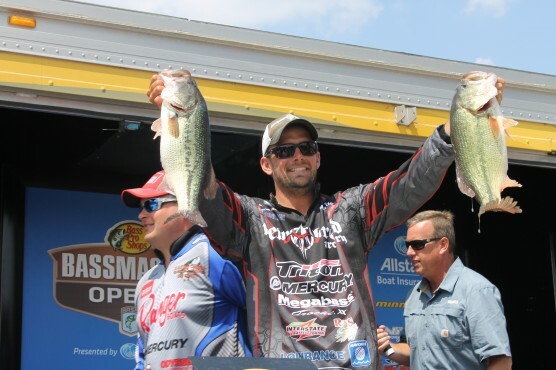 Today's outcome will be the first of three tournaments in the Northern Division and the winners that compete in all three regional events could secure a spot in the 2015 Bassmaster Classic, the “Super Bowl" of Professional Bass Fishing. The second stop of the Northern Open Series will take place in Plattsburgh, NY on Lake Champlain July 31- August 2, while the third and final event finishes up in Detroit, Michigan on the beautiful waters of Lake St. Clair September 4-6. The Bassmaster Opens are the doorway to making dreams come true for passionate anglers that are skilled enough to compete on this level.